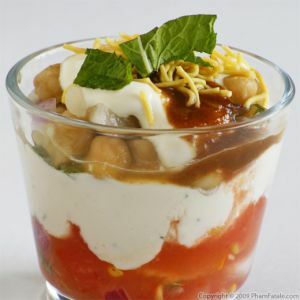 Contrary to what one would think, fruit chaat is not your average fruit salad, and it's not served as a dessert. It's a savory snack. Several types of fruits are chopped up and mixed together, then seasoned with Indian spices such as chili powder, ground cumin and salt. For fruit chaat, bananas and oranges are a must; today I also added apples, grapes, apricots and mangoes, but you could combine any other fruits that are in season. The first time I tasted it, my brain was expecting sweet flavors but my palate kept getting a savory signal. 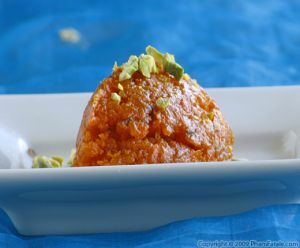 The subtle spiciness and tanginess with hints of cumin makes the dish very tasty. Next time you have a dinner party, this dish could make a perfect, and addition to your menu. For the mango: Cut the mango into small cubes. For the bananas: Peel and slice the bananas, then quarter each slice. 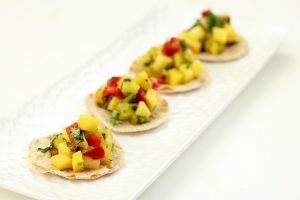 Add the diced mango to the bananas and coat them with 1 tablespoon lemon juice to prevent them from browning. For the apples: Repeat the same procedure with the diced apple and add 1 tablespoon lemon juice. For the oranges: Peel the oranges using a sharp chef's knife. Separate the segment in between each membrane wall. Cut the segment and gently pull it away from the fruit, removing all the membrane. Repeat and remove the rest of the segments. With the remaining orange, squeeze the juice and use it for another recipe. Assembly time: In a large bowl, combine the fruits. Add mint. Sprinkle with the spices, toss well and chill in the refrigerator for 1 hour. 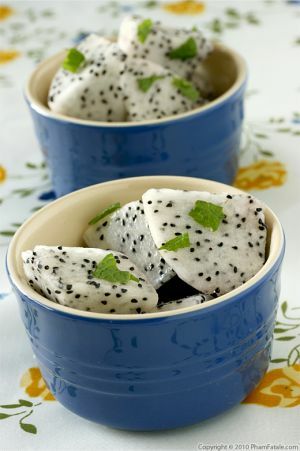 Serve in individual serving dishes chilled or at room temperature. 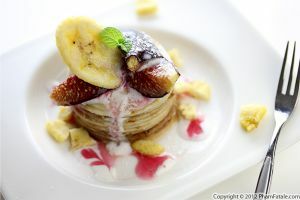 You could make fruit chaat with any other fruits such as papaya, pear, nectarine, plum, guava, cherry, pineapple or kiwi. The recipe is very flexible. The key to good fruit chaat is to have a homogeneous mixture. All the fruit should be cut the same size. ;I cut everything into ½-inch pieces. 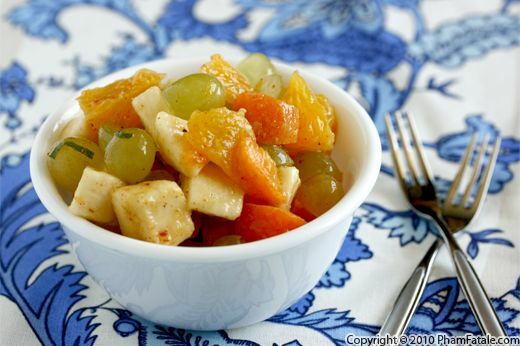 The other quality for Indian fruit salad in general is to have a good balance of the tangy, spicy and salty flavors. 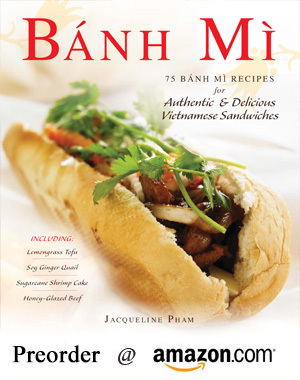 Published By: Jacqueline Pham on September 18, 2010.